The deck contractors of choice serving homeowners in Edwardsville, Illinois, and the surrounding communities is Chesley Fence & Deck. 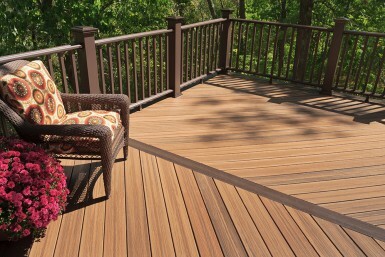 We have a long history of providing our customers premium decking products and outstanding installation services. In fact, having served local residents since 1967, we are one of the most experienced companies in the area. Wood decking – We offer treated lumber decks that are highly cost effective and can be painted and stained to your specifications. We also install premium Western Red Cedar decking, which has a warm, natural appearance and has better resistance to warping and cracking than the wood materials used by many other deck contractors. Composite decking – We offer several types of composite decking, however, we typically recommend our Tamko EverGrain® Envision ® PVC coated composite. This exceptionally durable product comes with a 20-year warranty that covers fading, stain resistance, and deterioration, and has a natural wood appearance that requires minimal upkeep. Chesley Fence & Deck is an A+ rated company with the Better Business Bureau, so you can rest assured that we take our commitment to customer satisfaction seriously. To learn more about what makes us the finest deck contractors serving Edwardsville, IL, contact us today.